A U.S. Marine Corps Vought AU-1 Corsair (BuNo 129378) parked at MCAS Quantico. Very cool! It'll be good to see a Corsair in GG/W again after all these years. Can't hardly wait! At least it ain't blue. or with a sharks mouth or invasion stripes. Being painted at Flying Colors Aviation in Benton Harbor, MI. The same shop responsible for the latest repaint of the CAF P-51C. I believe it will be based in the Chicago area when completed. There seems to be a little problem with the markings of the F4U-7 "Alberta Blue". The F4U-7 were constructed specifically for the French Navy starting around 1950. Alberta Blue has a 1944-45 era US insignia on an aircraft that was not to be constructed for five years!! Conversion to an AU-1 is a good alternative. It has the wrong insignia, and wrong color blue for a Corsair, because it was used in the production of Baa Baa Black Sheep so many years ago. It was the four-blader with the wing cannons that Pappy was seen flying most of the time. "Always remember that, when you enter the ocean or the forest, you are no longer at the top of the food chain." Love both the color scheme and the possibility she'll be based in the upper midwest. Should we assume the conversion ends with paint? Will anything FWF be changing? Nice. Always wanted to see an F4U in the Grey/ White scheme. Based in Chicago? I hope to see her at a future Thunder Over Michigan. I knew those markings were familiar! Off by one digit. One of my favorite box arts EVER! I have that box and have the art on my computer--would have posted it yesterday but I'm a victim of Photobucket. Thank you for doing it! BTW, the kit in the box is an F4U-1A. 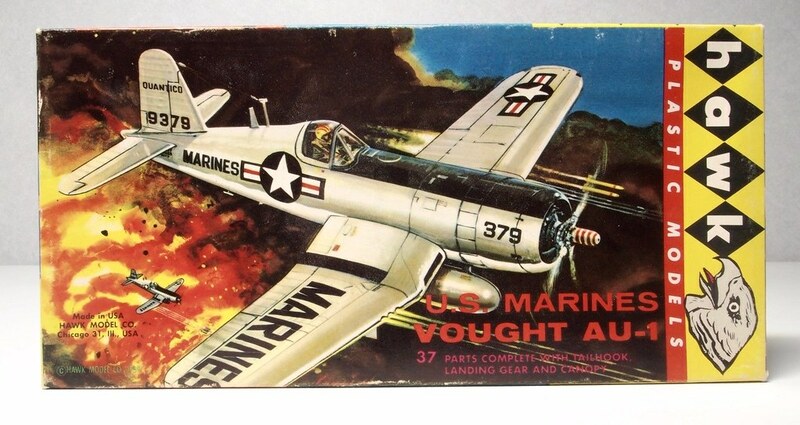 When I was a kid I had a 2-kit set from Hawk that had the Corsair and a Douglas F4D Skyray. Both were molded in white IIRC. I tried to build that Hawk kit, and never decided what version of Corsair they had in mind. Is it too soon to nit-pick the new paint scheme? It looks like the rear fuselage gray/white demarcation should be less straight and about a foot higher at the wing root. Going to be a handsome plane though. Though Alberta Blue does hold a place near and dear to my heart in the history of the warbirds movement (Baa Baa Blacksheep was must see TV in my youth), the Grey/White scheme is really going to be unique among extant Corsairs.